The human skin serves as a barrier to the outside world and is also rich in microorganisms. These microorganisms, collectively known as the “skin microbiome,” play a crucial role in maintaining human health. The microbiome is made up of many different types of microorganisms. It is a diverse community of bacteria, fungi, mites and viruses that when in homeostasis, provides protection against disease and keeps the skin looking smooth and moist. Skin diseases or changes in the appearance of your skin can arise from different causes. Many skin problems are associated with disruptions in the skin microbiome (known as “dysbiosis”). Skin disease may be caused by missing or overly abundant protein associated with dysbiosis, and in many cases by a strong inflammatory response to the changes in the microbiome. A dual strategy that focuses on both skin biochemistry and dysbiosis can lead to dramatic improvements in health and Azitra is developing products that address both aspects of disease and dysbiosis. There is a wealth of data demonstrating the importance of the microbiome to healthy, natural looking skin. Commensal bacteria, including many strains of Staphylococcus epidermidis, have adapted to live with us. Direct application of these commensal bacteria improves skin appearance, hydration, and tone through their interaction with the skin. Azitra is at the forefront of these efforts and is focused on making safe, effective, and easy to use, consumer health products. Combats undesirable bacteria on the skin. The microbiome and specific strains that live with us can be designed to become effective therapies using the tools of genetic engineering. Azitra engineers commensal skin bacteria to deliver critical disease-modifying proteins directly to the target through the stratum corneum of the skin. This approach represents a major platform technology adaptable to the expression of different proteins that target multiple diseases and skin care needs. These types of products are known as Live Biotherapeutic Products (LBPs) and are being developed as cost-effective topical applications with the potential to solve skin disease challenges. The advantages of such LBPs include the ability to directly address the cause of disease, ease of use, and topical application at the location of the skin problem—thus avoiding systemic therapy. Azitra is focused on LBPs that treat disease and control health care costs. Many diseases, including ichthyosis vulgaris as well as multiple orphan diseases such as Netherton syndrome, are the result of deficient or missing proteins in the skin. 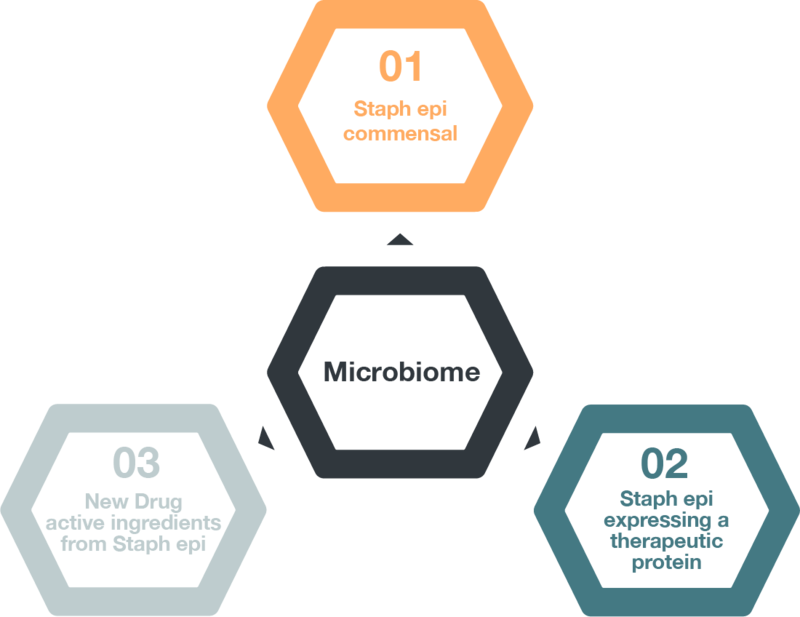 The microbiome (and specifically Staphylococcus epidermidis) can be engineered to deliver the proteins that can resolve the underlying disease cause and also return the microbiome to a more normal state. The benefits are slow, stable, consistent and effective release of protein, at the level of the target cell in the skin. Azitra has pioneered this work and established many of the foundation patents in the space. Azitra’s work is rapidly progressing to clinical testing and product introduction. Azitra has a discovery stage platform focused on the identification and development of bioactive compounds that can be derived from commensal bacterial strains. These compounds can be used for treating disease and addressing skin appearance. Funded by the Department of Defense, Azitra is working with the skin microbiome team at the Jackson Laboratory in Farmington, CT to explore the products derived from Staphylococcus epidermidis that can offer potential in skin disease. It has been well established that SE produces multiple unique biological products with potentially important therapeutic benefits. Azitra is pleased to be a critical element of the team exploring the promise of such products.